Native to the Mediterranean region, it is a generalist predator of various insects and mites1. 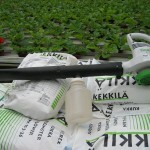 It was commercialised as a biocontrol agent in 2006.
swirskii feeds on thrips, whiteflies (greenhouse whitefly and Bemisia), and spider mites. It is known to perform better when fed a mixed diet of both whitefly and thrips2. 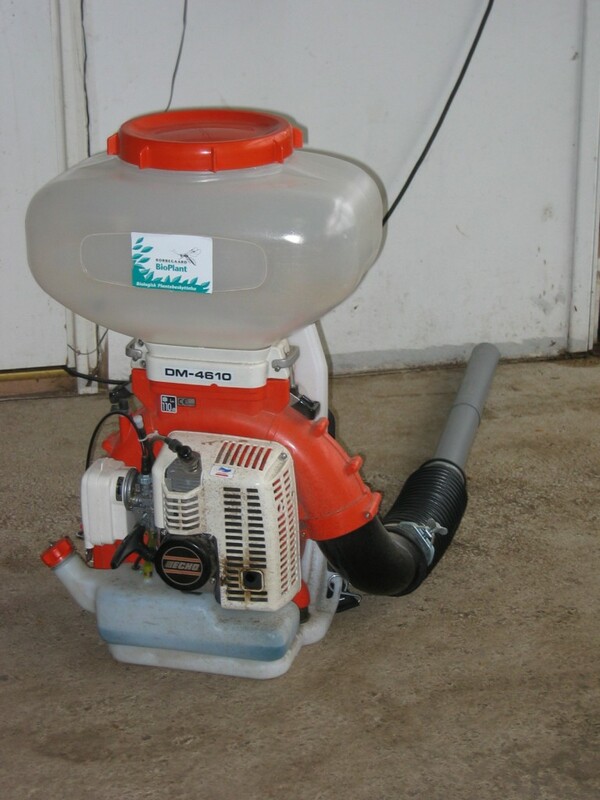 It also feeds on pollen and can establish on crops in the absence of pests if there is a pollen source available. A. swirskii (figure 1) looks similar to a number of other predatory mites such as Neoseiulus cucumeris, A. californicus, A. andersoni and A. fallacis. They are not readily distinguished from each other and identification requires an experienced taxonomist. The adult has 8 legs, is about 0.4 mm long and tan coloured. 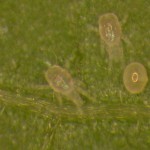 The eggs are usually laid on the underside of leaves on leaf hairs, often close to the junction of main leaf veins. The larvae are 6-legged, much paler in colour than the adult, very small and difficult to see (figure 2). 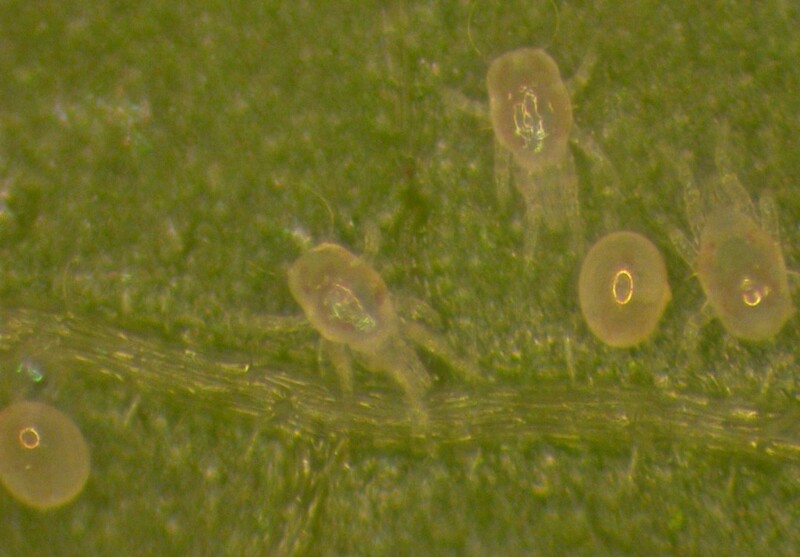 The later immature stages (protonymph and deutonymph) have 8 legs. 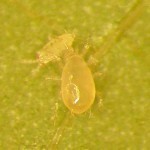 Adult female A. swirskii are able to eat an average of 5-6 first instar thrips per day. 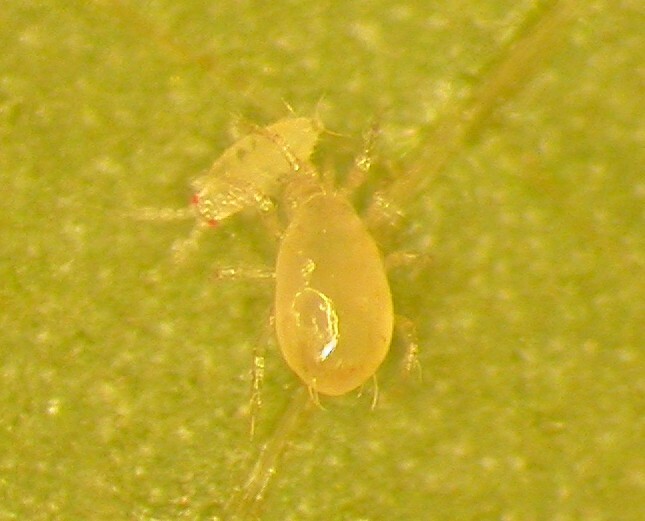 When feeding on thrips, adult A. swirskii lay around 1.4 eggs per day, and take around 7 days to develop from eggs into adult mites at 25ºC3. At 26oC, A. swirskii female adults can consume between 40-140 B. tabaci eggs at a rate of 15-20/day. Eggs and first instar nymphs are preferred over later immature stages, but it will feed on all stages. Approximately two eggs are laid per day through the adult stage. The average time for A. swirskii to develop from egg to adult on whiteflies is around 7.5 days at this temperature4,5. A. swirskii is packaged in a number of different ways. Bulk Product: Bulk formulations contain between 10,000 and 125,000 mites of all life stages mixed with bran or bran and vermiculite. Slow release breeding sachets: It is also available in slow-release ‘breeder’ sachets, either regular or LD (long duration) (figure 3). Depending on the producer, sachets contain 250-500 swirskii of all life stages mixed with bran and a food mite which serves as an alternative food source for the predator, allowing it to breed within the sachet. Each sachet can produce at least 2000 predators over 4-6 weeks for regular and 5-6 weeks for LD sachets. A small hole in the sachet allows the predatory mites to exit and move into the crop. It should be noted that the food mite used for A. swirskii (sugar mite or Carpoglyphus lactis) is different from that used for N. cucumeris. 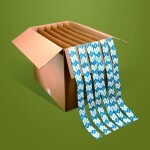 Mini slow-release sachets: These have a lower starting population of predators (100-250). These are mainly used in the ornamental industry, enabling growers to use slow-release sachets more economically in hanging baskets and potted plant production. 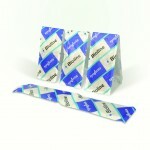 Double sachet: Known as a Gemini pack and produced by Syngenta BioLine. 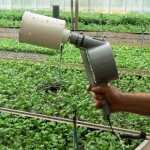 This product can be folded in half and hung over wires or plant branches (figure 4). 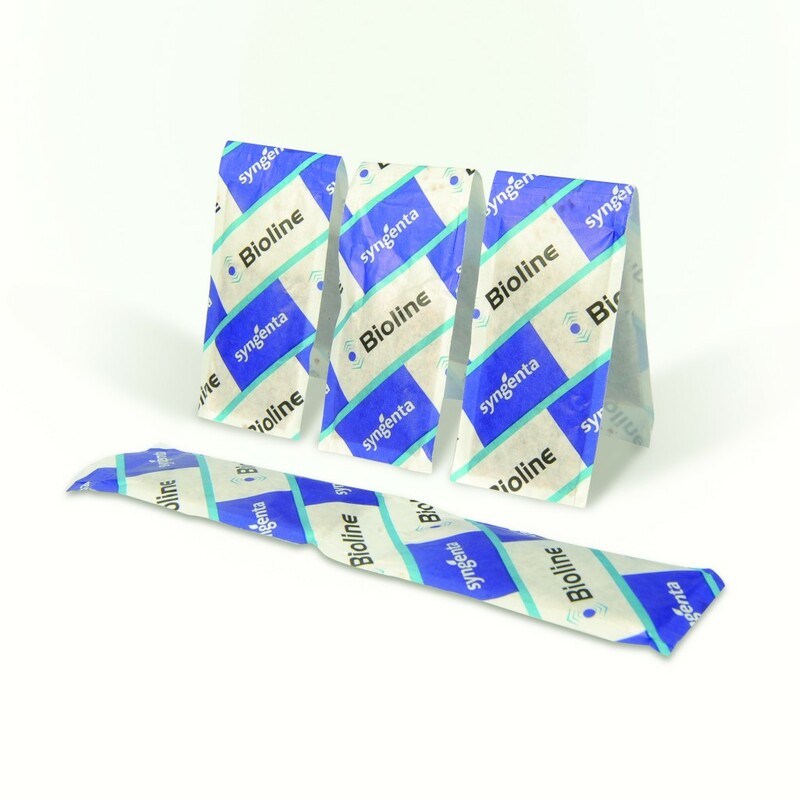 Continuous sachets: Also produced by Syngenta BioLine (as BugLine), this is a continuous length of sachets joined by perforations allowing for easy tearing. However, only 1 of every 3 sachets actually contains predatory mites. 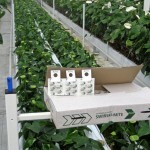 It is used for easy application in flower crops such as gerbera, where it can be laid along the length of crop row, with the empty sachets in the line acting as a bridge for the predatory mites to disperse the full length of the row (figure 5). Bulk product can be broadcast in a number of different ways. However it is done, it should be thoroughly mixed first according to the suppliers’ instructions to ensure even distribution of mites within the medium in which they are shipped. It can be manually sprinkled on the crop. Although this is very simple to do, it can be difficult to ensure even and consistent distribution. 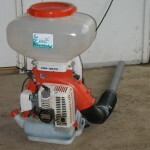 Mechanical blowers/spreaders are available that provide more even distribution. 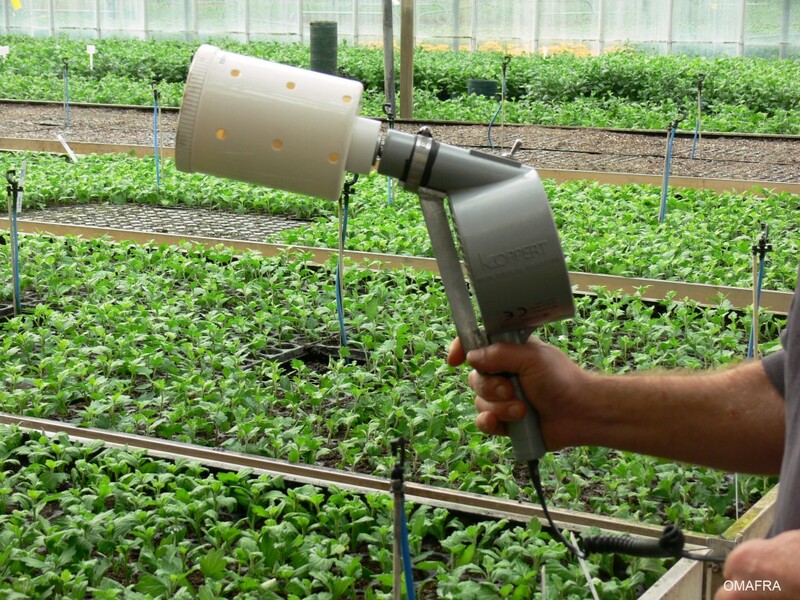 Some of these are sold or provided by the suppliers (figures 6 and 7) and some growers have developed their own devices(figures 8a and 8b). However, it should be noted that unless they are carefully tested, home-made spreaders may damage the mites by ripping their legs off or crushing them, or not provide the evenness of distribution hoped for. Slow-release sachets should be hung on plants out of the direct sun, to prevent high temperatures from killing the mites inside. 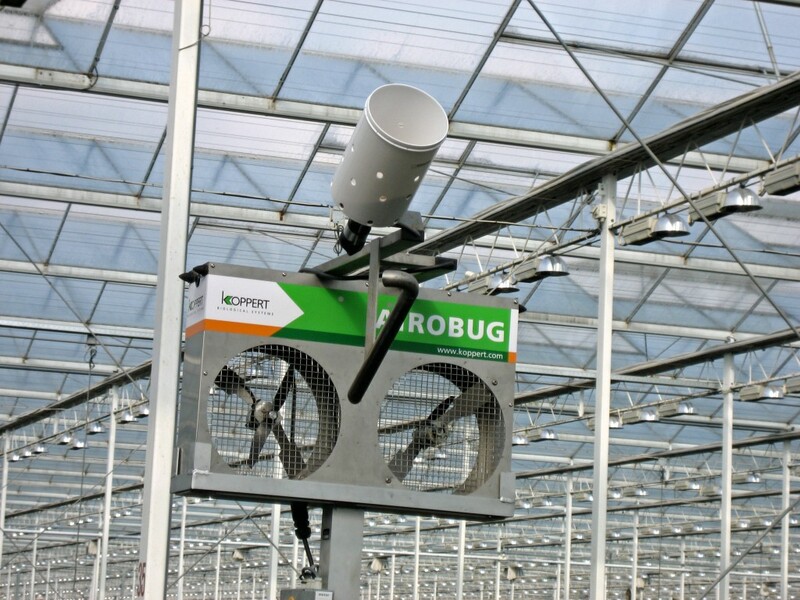 When possible, sachets should also be hung well within the plant canopy to provide a more humid environment (low humidity reduces the number of mites that emerge from the sachets). Sachets should not be in direct contact with water, however, some packaging is water resistant. Again follow instructions carefully. Some slow-release sachets are being produced with a small stake glued to the packaging that can be inserted into the growing medium, while keeping the sachet from touching the media itself. The stake makes distribution easier in some crops. For example, this is useful in young transplants which are not strong enough to support the weight of a sachet. Movement of predatory mites between plants is limited when the foliage of adjacent plants is not touching; Choose the right release method (i.e. broadcast, sachets) to ensure there are predators on all plants. 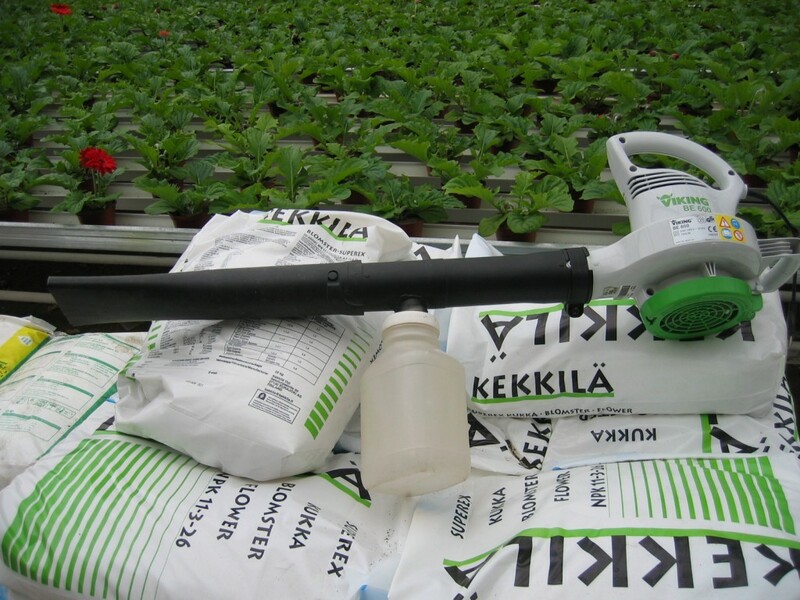 For whitefly and thrips control, the bulk product should be distributed on the crop at rates between 20-25 mites/m2 for preventative use and 100/m2 for curative purposes. Slow release breeder sachets should be distributed at the rate of 1 sachet/ 2-2.5 m2 for preventative or light infestations, and up to 1/m2 for heavier infestations for both thrips and whiteflies. 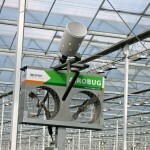 For crops highly susceptible to thrips damage (e.g. potted gerbera), some growers use rates as high as 1 sachet for every 6 pots. A higher number of mini sachets may be needed to protect young ornamental crops before the plant foliage is touching. In vegetables, sachets are widely used. Placement rates will depend on the crop and existing infestation levels. Bulk material is often used to supplement the sachets when a more rapid reduction in thrips populations is desired. Both sachets and bulk formulations have to be stored under specific conditions and used within a finite amount of time for best effect. This information is usually clearly displayed on the product packaging. A. swirskii is very tolerant of warm temperatures and will perform well even during the summer. A. swirskii mites are very small, but can be observed in areas of pest infestation and close to release points. To gain a better understanding of what the mites look like, and what the feeder mites look like in comparison, it is worth examining fresh product on receipt (use a hand lens). This also provides an opportunity to ensure that the mites are alive and healthy when they arrive. 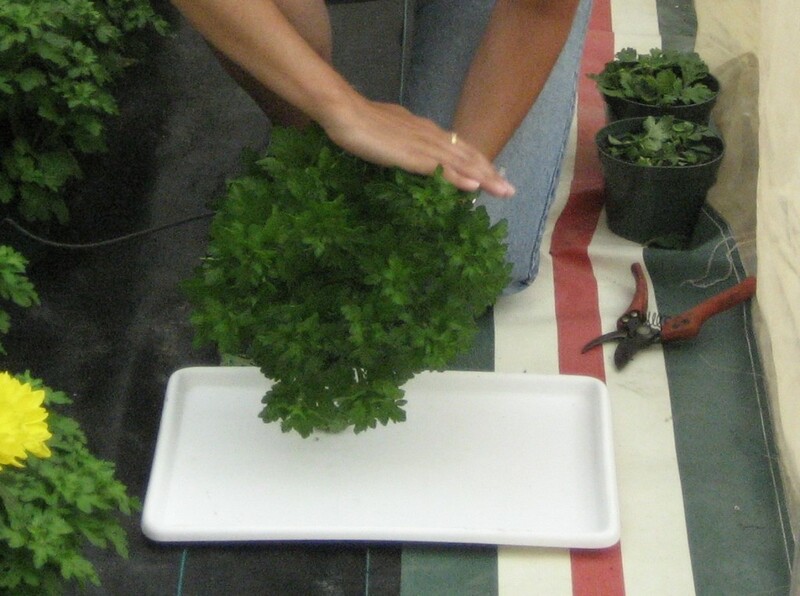 Tap plants or flowers over white paper or a white tray (figure 9) and examine for presence of predatory mites. 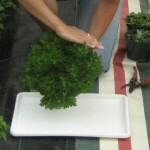 Mites should scurry across the surface of the tray when disturbed. Take a few sachets from the crop and open them to see if they are still producing predatory mites. Because it feeds on pollen, swirskii may establish more easily on flowering crops such as sweet pepper. On many ornamental crops where pollen is not produced (or desired) it may be more difficult for swirskii to establish in the absence of pests, unless supplemental food is applied to the crop. A. swirskii is often used in conjunction with other BCAs. For example, because it is considerably more expensive than A. cucumeris, they are often used in combination to reduce costs for thrips control. In lab trials, each species preyed on the other3, and in one report A. swirskii eliminated a population of N. cucumeris6. It should be noted however, that these interactions have not been demonstrated under commercial greenhouse conditions. A better approach is to use both predators at different stages of crop production. For example, cucumeris is frequently used early in the season when growing temperatures are cooler, with A. swirskii replacing N. cucumeris when temperatures rise during late spring/summer production. 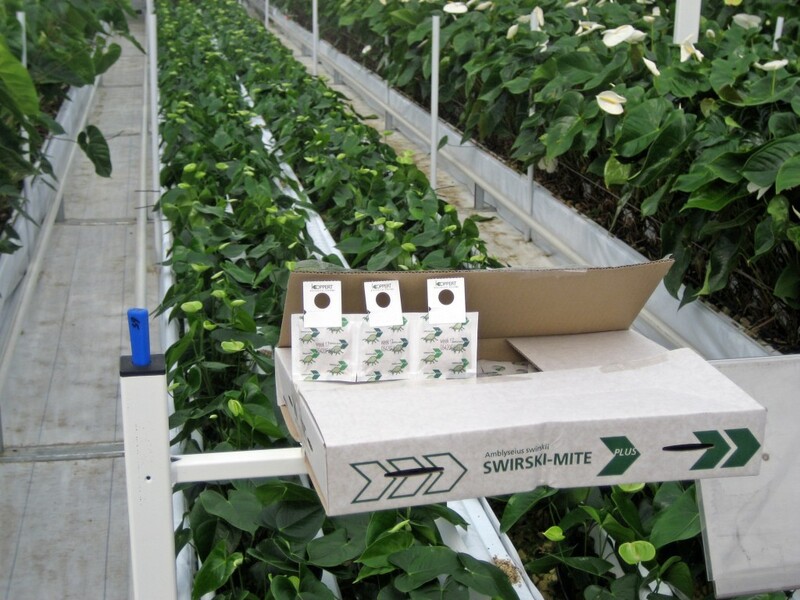 swirskii is very compatible with parasitic wasps (Encarsia and Eretmocerus) used for whitefly control because it feeds predominantly on whitefly eggs and crawlers, and parasitoids target whitefly pupae. swirskii will feed on Aphidoletes aphidimyza eggs, and it is recommended that these two BCAs should not be used together7. Gerling, D. 1986. Natural enemies of Bemisia tabaci, biological characteristics and potential as biological control agents: A review. Agriculture, Ecosystems and Environment, 17: 99-110. Messelink G, van Maanen R, Van Steenpaal S, Janssen A, 2008. Biological control of thrips and whiteflies by a shared predator: Two pests are better than one. Biological Control 44, 372-379. Buitenhuis, R., Shipp, J. L., Scott-Dupree, C. 2010: Intra-guild vs extra-guild prey: effect on predator fitness and preference of Amblyseius swirskii (Athias-Henriot) and Neoseiulus cucumeris (Oudemans) (Acari: Phytoseiidae). Bulletin of Entomological Research 100: 167-173. Fouly, A.H., Al-Deghairi, M.A. and Abdel Baky, N.F. 2011. Biological aspects and life tables of Typhlodromips swirskii (Acari: Phytoseiidae) fed Bemisia tabaci (Hemiptera: Aleyrodidae). Journal of Entomology, 8(1): 52-62. Nomikou, M., Janssen, A., Schraag, R. and Sabelis, M.W. 2004. Vulnerability of Bemisia tabaci immatures to phytoseiid predators: Consequences for oviposition and influence of alternative food. Entomologia Experimentalis et Applicata, 110: 95-102. Messelink G., van Steepaal, S. and van Wensveen, W. 2005. Typhlodromips swirskii (Athios-Henriot) (Acari: Phytoseiidae): a new predator for thrips control in greenhouse cucumber. IOBC/wprs Bulletin 28(1): 183-186. Heinz, K.M., R.G. Van Driesche and M.P. Parrella 2004. Biocontrol in Protected Culture, Ball Publishing, Batavia, Illinois. Buitenhuis, R., Murphy, G., Shipp, L. 2013: Aphis gossypii Glover, melon/cotton aphid, Aulacorthum solani (Kaltenbach), foxglove aphid, and other arthropod pests in greenhouse crops. In: Biological Control Programmes in Canada 2001-2012, Gillespie, D., Mason, P., eds. ): pp. 98-107. CABI, Wallingford, UK.?? Nomikou, M., Janssen, A., Schraag, R. and Sabelis, M.W. 2001. Phytoseiid predators as potential biological control agents for Bemisia tabaci. Experimental and Applied Acarology, 25: 271-291. Special issue on Amblyseius swirskii: Experimental and Applied Acarology 65, volume 4 (2015).